A fire can catch exceedingly fast. So why would it surprise anyone that the recent rise in the use of anything that isn’t steel framing for mid-rise construction projects has been accompanied by a steadily growing catalog of fires in dozens of cities across the U.S. and Canada? Steel has an obvious advantage in that its core ingredients are fire resistant. So, that begs the question that shouldn’t more steel structures be speced and built? 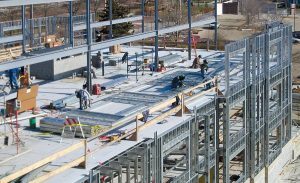 This article published by Walls & Ceilings – authored by Larry Williams, Steel Framing Industry Association- provides facts about the performance of cold-formed steel framing as a noncombustible material.